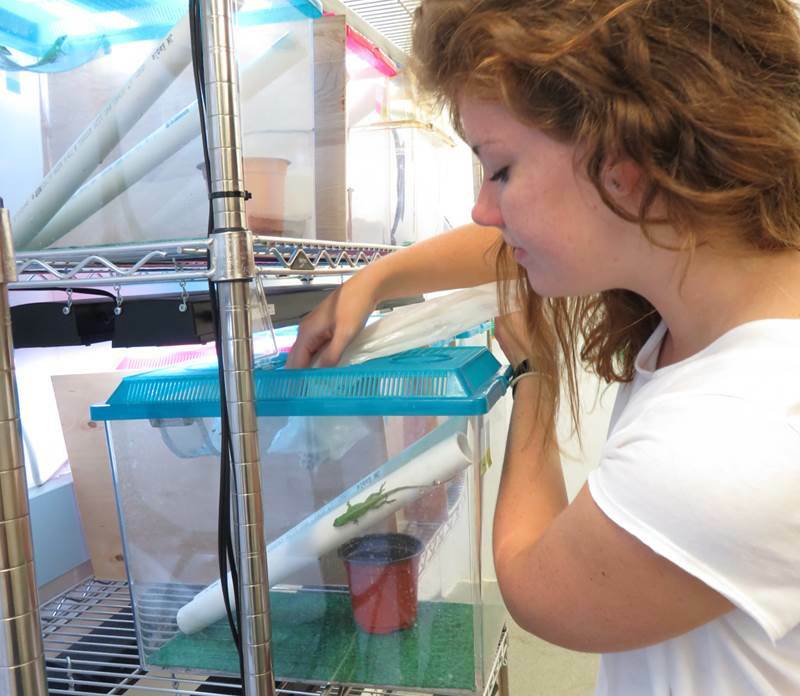 In the Lizard Lab, we all devote time every week to taking care of the lizards in the lab. Everyone shares this responsibility. (In fact, we even have a lab calendar to remind us whose turn it is to do lizard care every day!) The health of the lizards in our research is very important. Unhealthy lizards may act differently than healthy lizards, or their muscles may not work the same way, simply because they are sick. This could give us results we can’t trust. And, nobody likes a sick lizard – we like our lizards a lot and want them to be healthy. This is why we are very serious about taking good care of them! In the lizard room, each cage has one male and one female lizard. Every cage has two perches and a hammock (places for the lizards to sit), a nest box (where the female can lay eggs), and green carpet for the floor. Special lamps sit above every cage so all the lizards receive “full spectrum” light. This light is just like sunlight, and it helps the lizards make the vitamins they need and digest their food properly. The lizard cages are separated by a rectangular wooden board, because male lizards can be very aggressive with each other, and the board stops the males from seeing one another and becoming agitated. All of these things help keep the lizards comfortable, in a habitat similar to what they would prefer in their natural environment. Lizards also need food and water, and we work hard to make sure our lizards have enough to eat and drink. Every day, we give the lizards water by spraying the walls of their cages so they are covered in water droplets. Lizards drink water by licking these droplets (they won’t drink water from little cups). Three times a week, we feed the lizards crickets or mealworms. (It surprised me to learn that lizards don’t need to eat as often as you or me!) To feed the lizards, we scoop crickets into small bags and sprinkle a white powder, called calcium powder, onto them. This is to give the lizards the minerals they need, but don’t get unless they are outside in their natural environments. We then carefully shake five or so crickets into each cage. Usually, the lizards will immediately gobble up the nearest cricket—they can be fierce predators! Lizard care can be a lot of work, but we all know that it’s a big part of keeping our research running smoothly. Most importantly, we are keeping the lizards healthy and happy!